Monarda fistulosa is an herbaceous perennial that grows from slender creeping rhizomes, thus commonly occurring in large clumps. The plants are typically up to 3 ft (0.9 m) tall, with a few erect branches. Its leaves are about 2-3 in (5–8 cm) long, lance-shaped, and toothed. Its compact flower clusters are solitary at the ends of branches. Each cluster is about 1.5 in (4 cm) long, containing about 20–50 flowers. Wild bergamot often grows in rich soils in dry fields, thickets, and clearings, usually on limy soil. The plants generally flower from June to September. Monarda fistulosa ranges from Quebec to the Northwest Territories and British Columbia, south to Georgia, Texas, Arizona, Idaho, and northeastern Washington. The plant is noted for its fragrance, and is a source of oil of thyme. It is listed as historical in Rhode Island. It is listed as weed in Nebraska. Wild bergamot was considered a medicinal plant by many Native Americans including the Menominee, the Ojibwe, and the Winnebago (Ho-Chunk). It was used most commonly to treat colds, and was frequently made into a tea. Today, many families still use wild bergamot during the cold and flu season. The tea may be sweetened with honey, as it tends to be quite strong. The species of Monarda that may go under the common name “bee balm,” including M. fistulosa, have a long history of use as a medicinal plant by Native Americans, including the Blackfoot. The Blackfoot recognized the plant’s strong antiseptic action, and used poultices of the plant for skin infections and minor wounds. A tea made from the plant was also used to treat mouth and throat infections caused by dental caries and gingivitis. Bee balm is the natural source of the antiseptic thymol, the primary active ingredient in modern commercial mouthwash formulas. The Winnebago used a tea made from bee balm as a general stimulant. 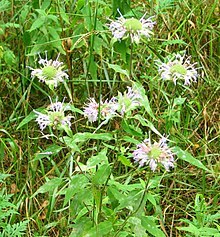 Bee balm was also used as a carminative herb by Native Americans to treat excessive flatulence. Leaves were eaten boiled with meat and a concoction of the plant was made into hair pomade. The herb is considered an active diaphoretic (sweat inducer). The essential oil of Monarda fistulosa was analyzed using mass spectrometry and arithmetical retention indices, and was found to contain p-cymene (32.5%), carvacrol (24.0%), thymol (12.6%), an aliphatic aldehyde (6.3%), the methyl ether of carvacrol (5.5%), α-pinene (3.5%), β-pinene (2.9%), sabinene hydrate (1.9%), α-terpinene (1.7%), citronellyl acetate (1.6%), and β-caryophyllene (1.1%). ^ “Monarda fistulosa“. Natural Resources Conservation Service PLANTS Database. USDA. Retrieved 5 August 2016. ^ “Plant Guide: Monarda fistulosa“ (PDF). Plant Materials, Natural Resources Conservation Service, United States Department of Agriculture. ^ Dickinson T, Metsger D, Bull J, Dickinson R. (2004) The ROM Field Guide to Wildflowers of Ontario, Toronto:ROM Museum, p. 293. ^ This taxon is sometimes referred to as Monarda fistulosa subsp. brevis; however, as of September 2011, that nomenclatural combination has not yet been validly published. ^ “Monarda fistulosa ssp. 1”. NatureServe Explorer. NatureServe. Retrieved 19 September 2011. ^ “Monarda fistulosa var. fistulosa”. NatureServe Explorer. NatureServe. Retrieved 19 September 2011. ^ “Monarda fistulosa var. longipetiolata”. NatureServe Explorer. NatureServe. Retrieved 19 September 2011. ^ “Monarda fistulosa var. maheuxii”. NatureServe Explorer. NatureServe. Retrieved 19 September 2011. ^ “Monarda fistulosa var. menthifolia”. NatureServe Explorer. NatureServe. Retrieved 19 September 2011. ^ “Monarda fistulosa var. mollis”. NatureServe Explorer. NatureServe. Retrieved 19 September 2011. ^ “Monarda fistulosa var. rubra”. NatureServe Explorer. NatureServe. Retrieved 19 September 2011. ^ This taxon is sometimes referred to as Monarda fistulosa var. stipitatoglandulosa; however, as of September 2011, that nomenclatural combination has not yet been validly published. The synonymous name Monarda stipitatoglandulosa is validly published. ^ “Monarda fistulosa var. 1”. NatureServe Explorer. NatureServe. Retrieved 19 September 2011. ^ a b “Monarda fistulosa“. Natural Resources Conservation Service PLANTS Database. USDA. Retrieved 22 January 2018. ^ Zamureenko, V. A.; Klyuev, N. A.; Bocharov, B. V.; Kabanov, V. S.; Zakharov, A. M. (Sep 1989). “An investigation of the component composition of the essential oil of Monarda fistulosa”. Chemistry of Natural Compounds. 25 (5).